Con base en el plugin de Mauricio de Paulo llamado WKTRaster para QGIS, fue posible agregar el soporte raster al plugin. De la misma forma, con algunas modificaciones a la tabla de contenido para aplicaciones basadas en PyQGIS se adicionó una tabla de contenido básica para desplegar varias propiedades de las capas. Python, PyQt4, PyQGIS y libqt4-sql-psql. Cómo instalar prerrequisitos en Windows: Ver blog. Cómo instalar prerrequisitos en Ubuntu/Linux: Para QGIS, ver página oficial de descargas. Para los demás programas usar apt-get o Synaptic. 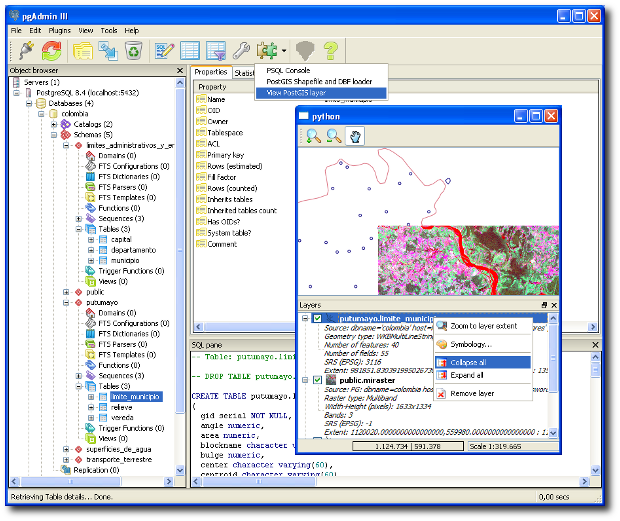 Para Ubuntu/Linux y Mac OS X descargar los archivos postgis_viewer.py y postgis_viewer_imgs.zip. 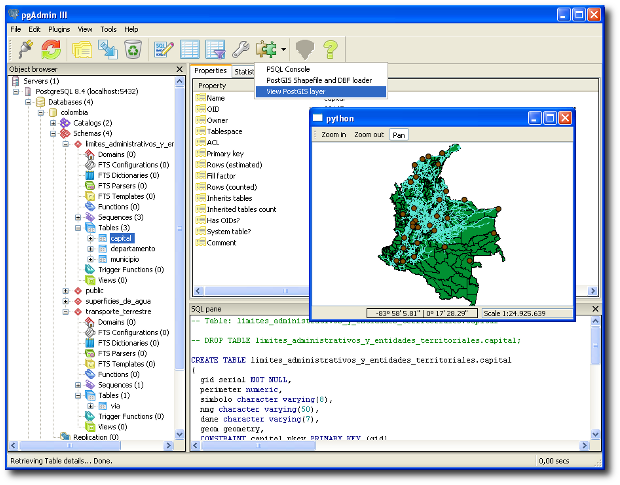 Para Windows descargar postgis_viewer.py , postgis_viewer.bat y postgis_viewer_imgs.zip. Command="$$PGBINDIR\postgis_viewer.bat" -h "$$HOSTNAME" -p "$$PORT" -U "$$USERNAME" -W "$$PASSWORD" -d "$$DATABASE" -s "$$SCHEMA" -t "$$OBJECTNAME"
El archivo postgis_viewer.bat se encarga de definir las variables de entorno del paquete OSGeo4W (Qt, Python, QGIS) para posteriormente ejecutar el archivo postgis_viewer.py En el archivo .bat se da por hecho que OSGeo4W está instalado en C:/ y que la ruta para acceder a PostgreSQL es C:/Archivos de programa/PostgreSQL/8.4/ Si se presentara algún inconveniente, se deben revisar dichas rutas. NOTA: Estas instrucciones están enfocadas en PostgreSQL 8.4 y pgAdmin 1.10. Desconozco el funcionamiento de los plugins en versiones superiores, el cual segun entiendo, ha sido modificado. Cuando sea oportuno actualizaré el post para mostrar cómo configurarlo en PostgreSQL 9.0. En todo caso, es bienvenido cualquier comentario sobre el funcionamiento del visor en PostgreSQL 9.0 y versiones recientes de pgAdmin. Ver actualización 1. Si los íconos de la ventana del plugin no aparecen, verificar las líneas 62 y 65 del archivo postgis_viewer.py. Allí es posible editar la ruta a la carpeta postgis_viewer_imgs. En Ubuntu/Linux se requiere la ruta absoluta a la carpeta, mientras que según las pruebas realizadas, en Windows tan solo se requiere la ruta relativa. La carpeta a donde se deben copiar los archivos postgis_viewer.py, postgis_viewer.bat y a donde se debe extraer postgis_viewer_imgs.zip es C:/Archivos de programa/PostgreSQL/9.0/bin, esto puede variar según la instalación de PostgreSQL, así que debe verificarse que en efecto exista. Las rutas de instalación de pgAdmin en linux no llevan el número de versión de PostgreSQL, por lo que las instrucciones expuestas en este post para PostgreSQL 8.4 deben funcionar para PostgreSQL 9.0. Read 69893 times	| Like this? Tweet it to your followers! This is a very good tutorial for the installation of postgis-viewer. But, the above plug-in requires the installation of OSGeo4W environment. The files, postgis_viewer.bat and the postgis_viewer.py, contain some variables which correspond to OSGeo4W paths. Because, i have installed seperate all these programs(Postgr eSQL 9.0, PostGIS 1.5.2, Python 2.6, Quantum 1.6) which are contained at OSGeo4W, i must change these paths for the good operation of plug-in. So, could anyone to show me how to configure these files??? in  (in Spanish only) I explained how to install and configure PyQGIS without OSGeo4W. It went good until QGIS 1.4. Then the package structure was changed and I've been unable to run it again (as standalone). Therefore, I had to start using OSGeo4W for PyQGIS and I'd recommend you using it. In that case you could still install PostgreSQL and PostGIS without OSGeo4W. By the way, this is not the final version of this plug-in, have you looked at this (http://geotux.tuxfamily.org/index.php?option=com_myblog&task=view&id=278&Itemid=59âŒ©=en)? Thanks a lot for tutorial! I've trying to set up the tool on Ubuntu 11.10 (Postgres 9.1, PostGIS 1.5.3, pgadmin3 1.14.0-beta1, QGIS & Qt installed and working). "E: Qt or QGIS not installed." Could you please point me to any solutions to that? If the problem still persists, please go to the postgis_viewer.py file and try to run in a python console lines 42 to 50, one by one. This way you can discover if there is any PyQt4 module you are missing. Congratulations on your post. I followed your step by step tutorial. the plugin name appears on the icon of pgadmin, but fails to appear for the fact I view the maps. There are two folders postgis_viewer. One in / usr / bin and another in / usr / bin / postgis_viewer. I have already put in both, and nothing worked. Do you have any suggestion about how I can dyscovery my mistake? I forgot sqy something. I can run post viewer, but, course, out of the pgadmin. It has a simplified installation. Yes, this was my first choice, but a more complex thought could solve the problem. Anyway, I threw out the installation that had postgis_viewer_ imgs and tried again with your suggestion. It did not work. The problem continues. I began everything again and, it's work. Indeed I changed directly in the plugin.ini file. Put in there all my information, include the geometry column. The post_viewer open now through the icon 'plugin' from pgadmin. I can't see nothing in there, but I believe is a problem to know consult. Let's see. I made the right thing? it can be because the directory "/usr/bin" is not registered as PostgreSQL bin path. Please go to pgAdmin3, File-->Options-->General tab-->PG bin path and check the folder. If it's in fact different, extract the postgis_viewer.zip file right there. If that's not the problem, please take the plugins.ini content from the newest post of this series , as you see, they are a bit different. Just copy the content as it is, you don't need to edit anything to adjust it for your data or so. If you still have troubles with this installation send me your plugins.ini file, or think of giving me access to your machine for a while, so I can take a closer look at this. I write plugin.ini exactly like recommend here. Ok it's work. thanks! 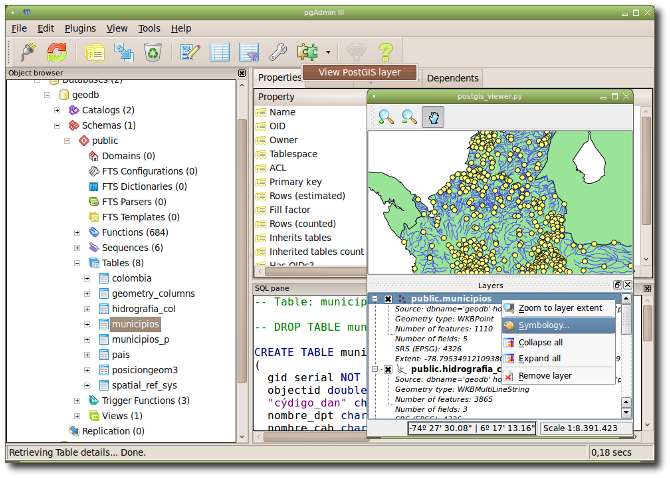 can anyone xplain this for qgis 2.0.1,posgresql 9.3.4 and postgis 2.1.3.
i have installed python 2.7.8 x64 bit, pyqt4 for python 2.7 and all.....Now i want to install postgis viewer in my database. please explain in english soon.